A couple of weeks ago I went to the Sewcialite Soiree, hosted by Sarah from Like Sew Amazing, Jen from Gingerella and the Stitch Sisters Rachel and Nikki and it was a brilliant night. And of course it was an excuse to make a new outfit. But I thought about the fact that I have a few party dresses which I’ve only worn once or twice, and decided to make a suit instead of another dress, since I would then wear the trousers and jacket separately and then I’d have a suit too! 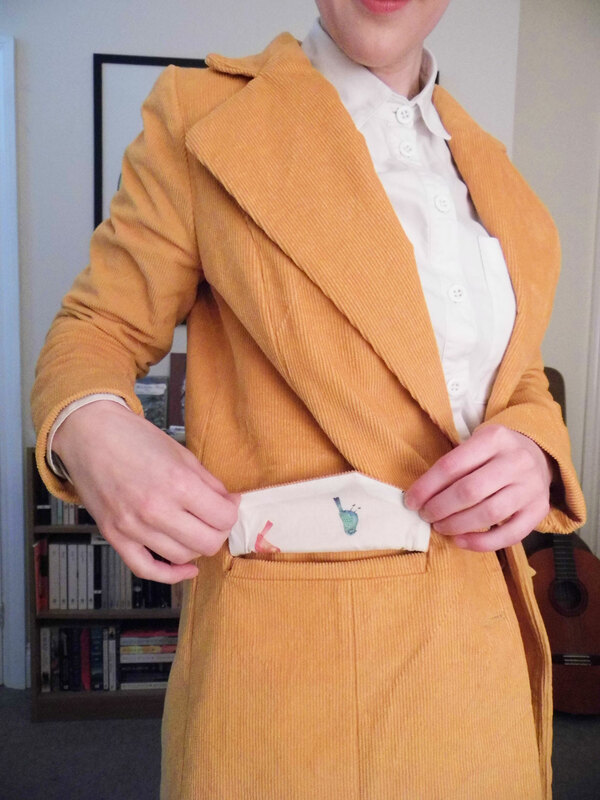 I do have the suit I refashioned from one of my dad’s suits, but I’ve not worn the jacket since I took the photos to be honest – I have higher hopes for this jacket though as it’s a bit less formal because of the fabric I think. My initial plan was to make a tuxedo but I didn’t really need another black jacket or black pair of trousers in my wardrobe, so I went for corduroy instead. 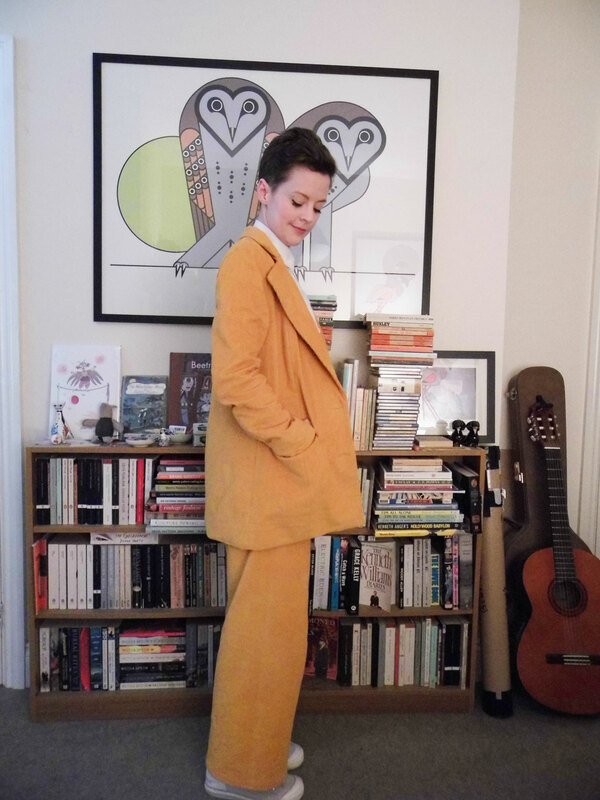 I have a pinterest board of inspirational bright coloured suits. The fabric was this mustard corduroy from Fabricland (and I have loads left so expect a whole corduroy wardrobe in the future). I ordered a few samples from Fabricland and some crepe ones from Sew Over It – it’s really amazing how many different colours are called mustard! And the lining is this adorable bird print cotton lawn from Sewisfaction – she posted it on her stories and I immediately fell in love with it. 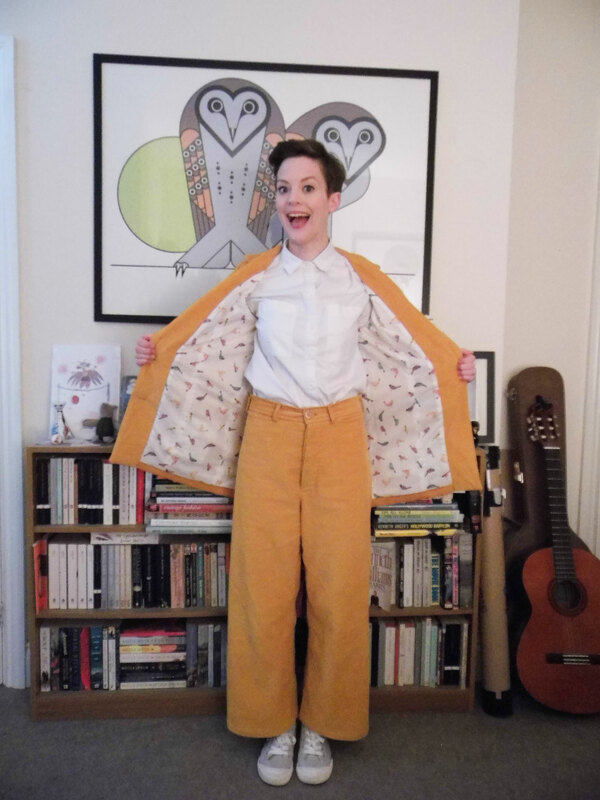 The patterns I used were the very popular Persephone Pants, which I feel like I’m the last person to make! and the Joe Jacket by Ready to Sew. I searched for quite a while for a jacket pattern I liked and this was the closest to the boyfriend fit I was looking for. Plus it has 2 lapel variations and I went for these super wide ones! And I love them. 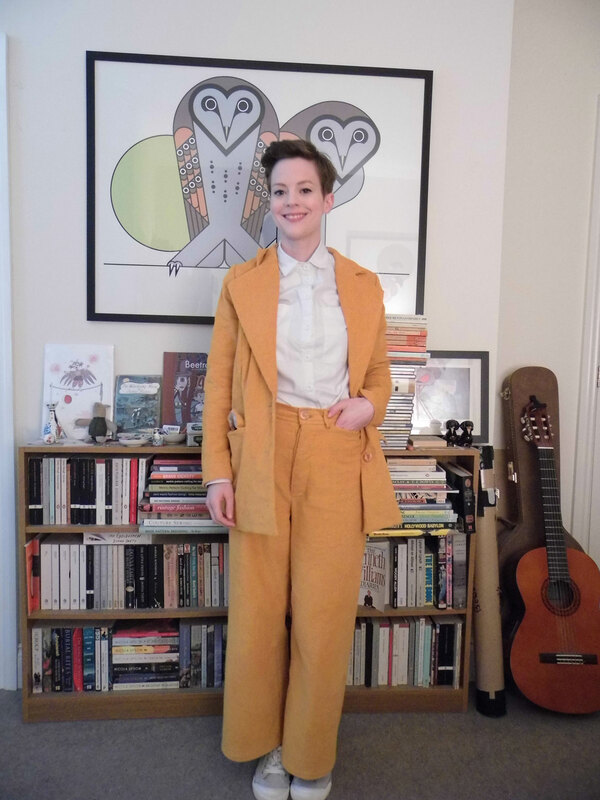 This was the first Ready to Sew pattern I’ve made and I have to say the instructions were excellent – this is the most tailored item I’ve made I think, maybe apart from my Honetone Coat. 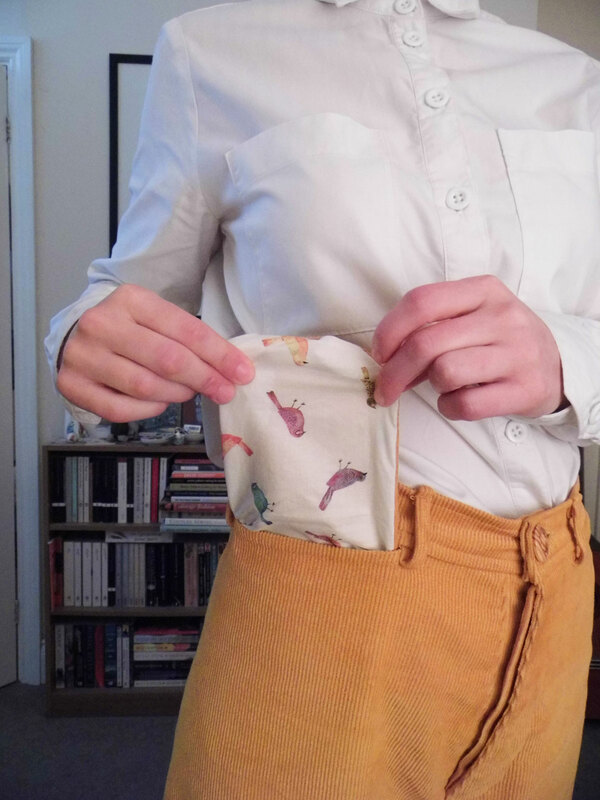 There are 2 welt pockets with pocket flaps over the top, and this was the only place I got a bit confused by the instructions – which is surprising because I’ve done welt pockets before. There was a great youtube video I found, which really helped as the pocket in the video is the same as the ones in this jacket. They were meant to be double welt pockets but since the corduroy was so thick and tricky to iron, I did single welts instead. I love the flash of lining fabric behind the flaps. I bought these lovely wooden buttons from John Lewis – they were a pack of 3, so there were 2 for the jacket and one for the trousers. 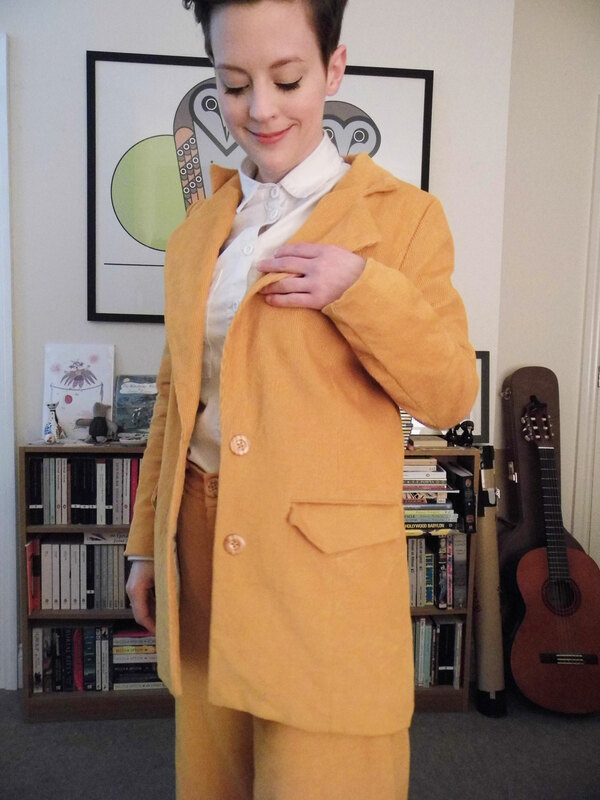 When I’d finished the jacket, I was worried it was a bit too long, but actually I think it’s fine – because it’s a loose fit, I think it’s fine. And I looked at other suits and just below the bum seems to be a common jacket length. I made the size 36 in the jacket and made no fitting changes. I did, however, have to redo the sleeves as I was in a hurry when I was cutting it out and didn’t put any of the notches and markings on the fabric and sewed them in really twisted. So my advice for this pattern (and obviously all patterns) is to transfer all the markings! I made the size 4 of the Persephone Pants as they exactly matched my waist and hip measurements and, again, the instructions were great. I didn’t make any adjustments, but the next time I make them I will take them in a little on the back seam and the waist, adjusting the waistband too so it still fits. I love the hidden pockets, and I used the same lining as the jacket. 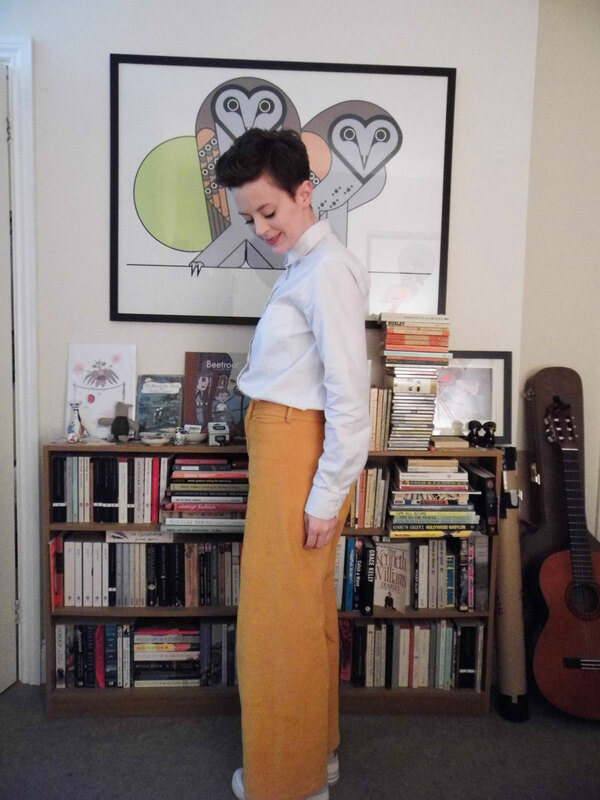 I took 7cm off the hem (4cm cut off and 1.5cm twice as the hem) as I wanted the trousers a little cropped – as I think they’re supposed to be. I then, however, had to take another 3cm off as they were still a little longer than I wanted. I wore the suit exactly like this to the party, with my white Archer shirt and with these light coloured trainers. I like the look of heels, but I end up wanting to take them off about 10 minutes into any party, so I decided to be comfortable instead. 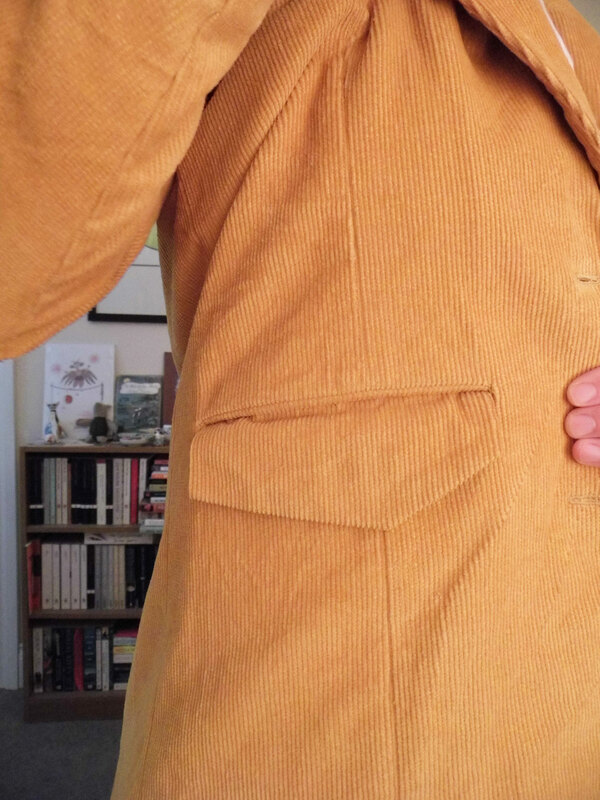 I learned a bit about dealing with corduroy in the making of this suit – namely that you have to iron it on a towel and on the back – or sandwiched between 2 towels if you have to iron something 2-sided, like the lapels. 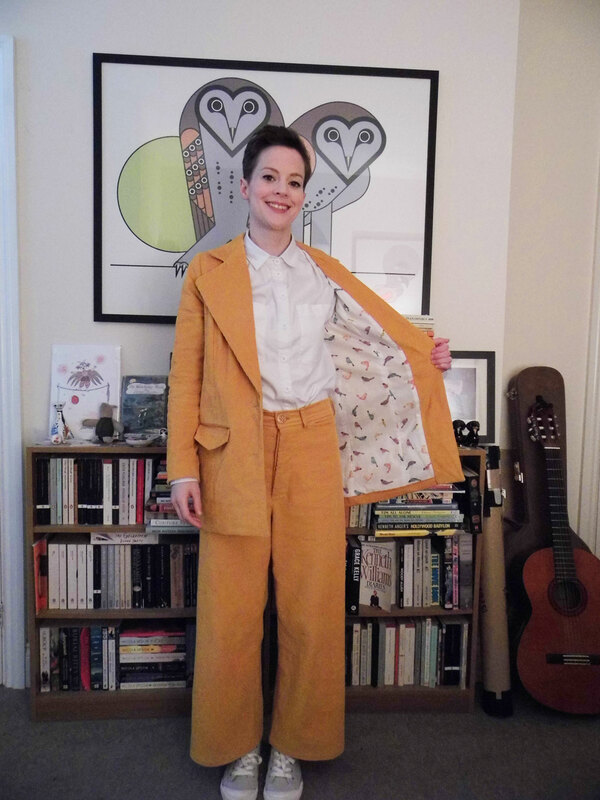 I definitely want to make both of these patterns again – there’s a photo of Claire Foy in a pink suit, which inspired this one, and in a houndstooth blazer with jeans and I want to fully copy that. 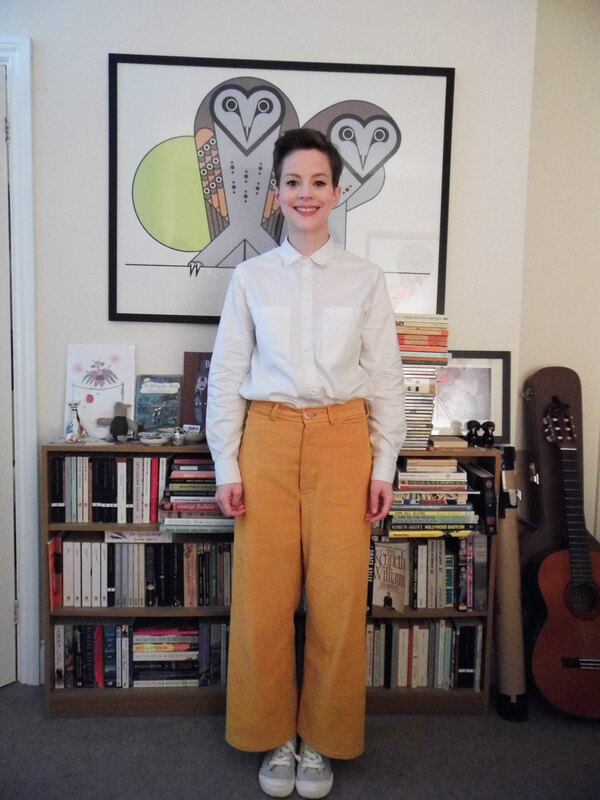 I also love the trousers and with the little tweak to the fit, this could become my go-to pattern for work trousers. I also had a slight epiphany while making this suit- namely that if I don’t watch Netflix which I sew, I can sew really quickly and needed to unpick a lot, lot less than normal – on average I probably unpick every third seam I sew, but with this whole suit I only unpicked the sleeves on the jacket (because I sewed them on wrong) and a couple of other tiny things! 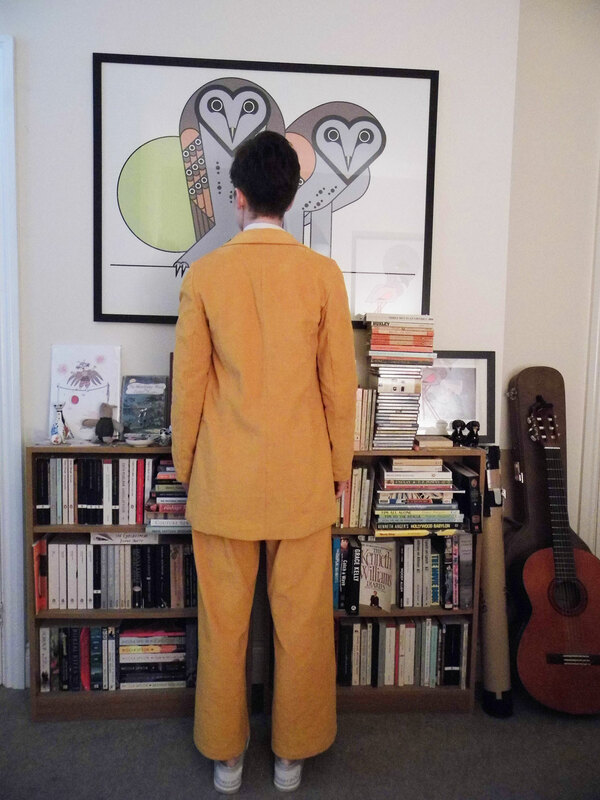 Have you every made a suit or just a jacket? 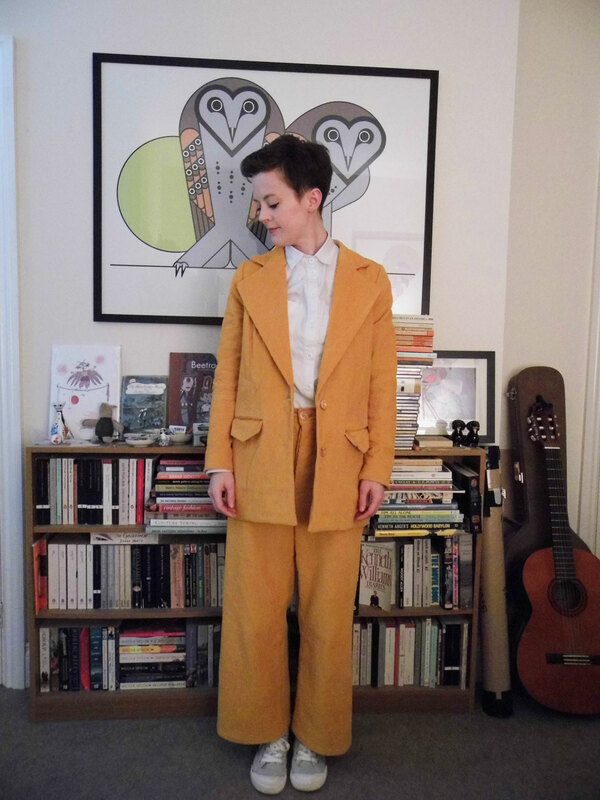 Do you like tailoring as much as I do?